One of the things I love about the Internet is how it beings people together and helps them connect. A few years ago I connected with John Lilly thorough our shared interests in online marketing. John has an extensive background in media and digital advertising and we recently re-connected over a new project John is undertaking – Video Business and Product Promotions through his company, Stream Serve Inc. A niche off-shoot of John’s new business, that dove-tails nicely with Top Lawyers, is creating Lawyer Video Profiles. 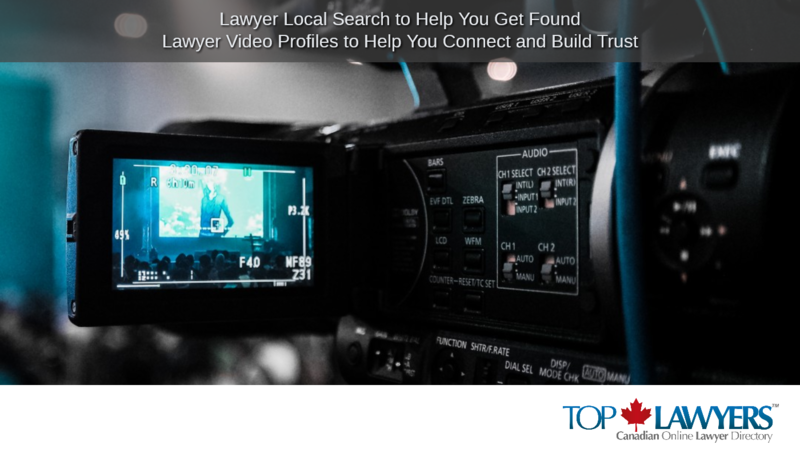 A lawyer video profile allows you to market your practice and legal expertise while building trust and accessibility. John has put together a unique product offering for Lawyers in the GTA. Please see the below and click here to order. Whether you are a sole practitioner or a law firm with offices across Canada, our national online lawyer directory, toplawyerscanada.ca; and our related municipal based lawyer directories, give you the exposure you need in a competitive legal marketplace. Contact us today!